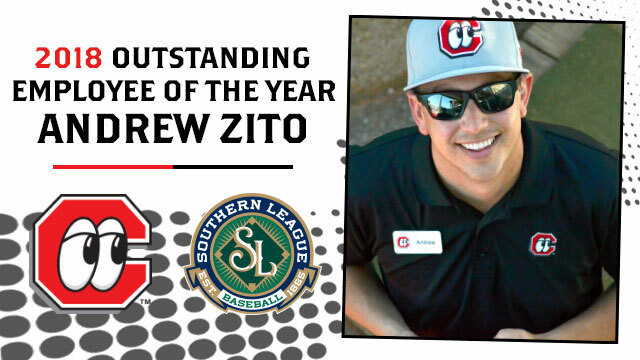 CHATTANOOGA, Tenn. - Today, the Southern League announced that Chattanooga Lookouts Vice President Andrew Zito, has been named its Outstanding Employee of the Year, as voted upon by the league's general managers. Zito is the first employee from Chattanooga to receive this award. "Andrew has been with this organization for over seven years and has made a lasting impact on the Chattanooga community," said Lookouts President Rich Mozingo. "It is great to see him get recognized for his hard work. We couldn't be prouder." In 2012, Zito was hired as a part of the Lookouts inaugural internship class. As the Lookouts Food and Beverage Intern, the Fort Myers native assisted in the day-to-day operations of the Lookouts concessions. After the season Zito was brought on full time as a Lookouts Group Sales Manager. Prior the 2018 campaign, Zito was named the Lookouts Vice President after serving as the team's Director of Group Sales for two years. This year he oversaw a sales team that posted its highest grossing year in team history. The team also had a record year in terms of suite sales and had their highest average attendance since 2015. "I am thankful and honored to be recognized for this award," Zito said. "A lot goes into a baseball season and I wouldn't be receiving this award if it weren't for our incredible Front Office team. We accomplished a lot in 2018 and I am unbelievably proud of our staff." In addition to being the Lookouts Vice President, Zito is also very active in the Chattanooga Community. This year he served as the President of the North Chattanooga Council of the Chattanooga Chamber of Commerce. The NCCC was recognized earlier this month as the 2018 Chattanooga Chamber of the year. Zito is also the chair of the United Way Emerging Leaders. The Chattanooga Lookouts, a founding member of the Southern League in 1885, are the 2015 & 2017 Southern League Champions and the Class AA affiliate of the Minnesota Twins. The Lookouts play their home games at AT&T Field, located on Hawk Hill in downtown Chattanooga. For more information, keep up with the Lookouts year-round at www.lookouts.com, or by following us on Facebook (www.facebook.com/Chattanooga Lookouts), Twitter (@ChattLookouts) and Instagram (@ChattLookouts).